The aim of this study is a phylogenetic reconstruction of the genus Cheilosia using larval characters. The study is based on 1195 third instar larvae and 210 exuviae with associated adults, belonging to 35 Cheilosia species, plus information about the morphology of Cheilosia larvae available from the literature. In addition, the morphology of larvae of the genera Eumerus, Ferdinandea, Merodon, Myathropa, Portevinia and Rhingia is examined. Methods of collecting and rearing larvae, and of preparing larval material for study are described. The morphology of the third stage larva and the exuviae is described in detail. A German terminology for morphological features used in describing the larvae is introduced, based on the existing literature. Original observations on the food plants of Cheilosia species are presented and food plant information from the literature is critically discussed. It is concluded that reliable information is available for 45 Cheilosia species. 219 morphological characters are identified as being of diagnostic significance in comparing Cheilosia larvae. These characters are used in the construction of a key to the known Cheilosia-larvae. 81 of these characters are recognised as suitable for use in a phylogenetic reconstruction of the genus Cheilosia. Using these 81 characters a computerized cladistic analysis has been carried out (software PAUP 4.0), leading to a strict consensus cladogram. Incorporating Ferdinandea and Rhingia as outgroups, and using the morphology of the first instar larvae of three Cheilosia species, allows evaluation of a priori hypotheses concerning the plesiomorph character state of 54 characters. Using these 54 characters a second cladogram is constructed, following the traditional Hennigian methodology. The two different phylogenetic hypotheses are compared and a synthesis between the two is presented. Part of this synthesis is a suggestion to divide the genus Cheilosia in a series of species groups. A nomenclature for these species groups is proposed. Ten monophyletic groups are recognised among the Cheilosia species that are used in this study: the subgenera Cartosyrphus, Neocheilosia, Chilomyia, Nigrocheilosia and Dasychilosia, and the five species groups proxima group, fasciata group, alpina group, albitarsis group, and urbana group. A review of existing subdivisions of the genus Cheilosia is presented and the ideas expressed in the literature are compared with the results of the present study. There is a high degree of agreement that the species can be combined into meaningful species groups. The perceptions of the phylogenetic relationships between species groups recognised by different authors clearly differ. The morphological characters used here cannot be expected to provide a basis for identification of all the phylogenetic relationships existing within the genus Cheilosia. There are no characters among them that separate the most closely related species. The relationships between basally divided species groups are unclear because of a high rate of convergences. The phylogenetic relationships postulated to exist between Cheilosia species are compared with food plant data. No parallel cladogenesis of Cheilosia species and food plants is found. Several monophyletic species groups recognised in the genus Cheilosia do characteristically feed on particular groups of plants. The suitablity of larval characters for use in phylogenetic reconstruction is discussed: Larval morphology provides additional characters for employment in engendering a phylogenetic hypothesis. But there are several problems intrinsic to the use of larval characters: there are fewer characters offered by Cheilosia larvae than by Cheilosia adults. The terminal and basal branches of the phylogeny cannot be detected satisfactory. Larval morphology is less understood than is the morphology of the adults. There are only a few reference collections of larvae available and less than 8 % of the described Cheilosia species can be accessed from such sources. It is concluded that it would be unjustified to introduce changes in nomenclature based on this study. Ziel der vorliegenden Arbeit ist es, anhand larvalmorphologischer Merkmale die Verwandtschaftsbeziehung innerhalb der Gattung Cheilosia zu rekonstruieren. Grundlage der Untersuchung sind 1195 Larven des dritten Larvenstadiums und 210 Exuvien mit geschlüpften Imagines von 35 Cheilosia-Arten und die larvalmorphologische Literatur zur Gattung Cheilosia. Zu Vergleichszwecken wurden außerdem Larven der Gattungen Eumerus, Ferdinandea, Merodon, Myathropa, Portevinia und Rhingia untersucht. Die Methoden zum Sammeln, Züchten und Aufarbeiten des Materials werden dargestellt. Ausführlich wird die Morphologie des dritten Larvenstadiums und der Exuvie der Gattung Cheilosia beschrieben. Dabei wird, basierend auf einer Literaturauswertung, eine Terminologie zur Beschreibung der Cheilosia-Larven vorgeschlagen. Aufgrund eigener Beobachtungen und einer kritischen Literatursichtung werden Angaben zum Nahrungspflanzenspektrum der Cheilosia-Larven gesammelt und gewertet. Zu 45 Cheilosia-Arten liegen zuverlässige Angaben vor. Durch den Vergleich der vorliegenden Cheilosia-Larven werden 219 diagnostische Merkmale gefunden. Ausgehend von diesen Merkmalen wird ein Bestimmungsschlüssel der bisher bekannten Cheilosia-Larven vorgelegt. 81 der Merkmale eignen sich für eine phylogenetische Rekonstruktion innerhalb der Gattung Cheilosia. Aufgrund dieser 81 Merkmale wird mit dem Computer (Programm PAUP 4.0) ein Kladogramm der Cheilosia-Arten ermittelt. 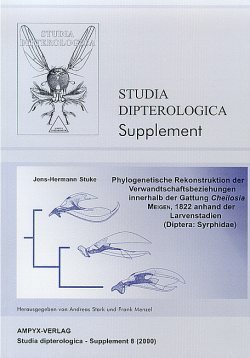 Durch den Vergleich mit den Außengruppen Ferdinandea und Rhingia und unter Berücksichtigung der ersten Larvenstadien von drei Cheilosia-Arten kann bei 54 Merkmalen eine a priori Hypothese zur plesiomorphen Merkmalsausbildung aufgestellt werden. Diese 54 Merkmale sind die Grundlage, um "per Hand" ein zweites Kladogramm zu erstellen. Aus dem Vergleich der beiden so ermittelten Kladogramme wird eine Synthese abgeleitet. Ein Vorschlag zur Abgrenzung und Benennung monophyletischer Artengruppen innerhalb der Gattung Cheilosia wird aufgestellt. Die hier behandelten Arten lassen sich zu zehn Artengruppen zusammenfassen: den Untergattungen Cartosyrphus, Neocheilosia, Chilomyia, Nigrocheilosia und Dasychilosia sowie den fünf Artengruppen proxima-Gruppe, fasciata-Gruppe, alpina-Gruppe, albitarsis-Gruppe und urbana-Gruppe. Nach einem Überblick über die bisherigen Gliederungsvorschlägen für die Gattung Cheilosia werden verschiedene Ergebnisse verglichen. In der Zusammenfassung von Arten zu monophyletischen Artengruppen wird eine weitgehende Übereinstimmung gefunden, die Anordnung der Artengruppen zueinander unterscheidet sich deutlich. In ihrer Gesamtheit sind die verwandten Merkmale nicht geeignet die Verwandtschaftsverhältnisse sehr nahe verwandter Arten aufzulösen, da sich keine geeigneten Merkmalsänderungen ausgebildet haben. Bei sehr weitläufigen Verwandtschaftsverhältnissen, wie sie zwischen verschiedenen Artengruppen bestehen, wird die Verwandtschaftsanalyse durch Konvergenzen erschwert. Anhand der aufgestellten Verwandtschaftshypothese wird das Nahrungspflanzenspektrum der Cheilosia-Arten diskutiert. Eine parallele Evolution von Cheilosia-Arten und den Nahrungspflanzen der Larven kann weitgehend ausgeschlossen werden. Einzelne monophyletische Gruppen der Cheilosia sind an ein spezifisches Nahrungspflanzenspektrum gebunden. Abschließend wird das Vorgehen, anhand der Larven die Phylogenie der Gattung Cheilosia zu rekonstruieren, reflektiert: Mit der Larvenmorphologie steht ein zusätzlicher Merkmalskomplex zur Verfügung. Eine Reihe von Problemen beim Einsatz von Larvenmerkmalen beeinträchtigt allerdings die Verwendung dieser Merkmale: Die Cheilosia-Larven sind im Vergleich zu den Imagines merkmalsarm. Mit den hier berücksichtigten Merkmalen sind sehr nahe und sehr weitläufige Verwandtschaftsbeziehungen nicht oder nur unzureichend aufzulösen. Der Kenntnisstand um die Morphologie der Larven ist oft unzureichend. Besonders aufgrund des Fehlens von Larven-Sammlungen stehen weniger als 8 % der bislang beschriebenen Cheilosia-Arten zur Bearbeitung zur Verfügung. Aus praktischen Erwägungen sollen keine nomenklatorischen Konsequenzen aus der vorliegenden Untersuchung gezogen werden.